Her comes something fresh, something radically new, something really audacious: A five Star Hotel completely re-imagined and redone by Philippe Starck, the enfant terrible of French design and decoration. 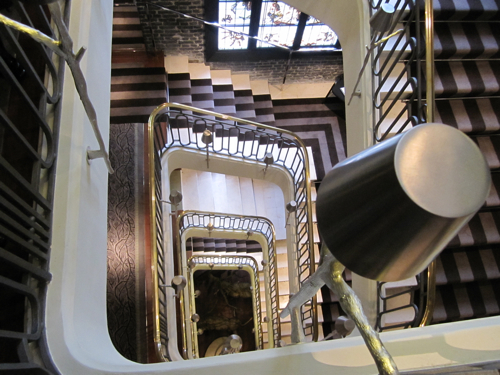 The new Royal Monceau Raffles is the reinvention of what they call the Parisian Palace. And a reinvention it really is. After two years of reshaping, the hotel will open its doors on 18th of October and you should be prepared for something special, a new formula of the five star category. The rumour goes that the re-invention oft the Hotel, owned by Qatari Diar Hotel and Property Investment, probably had cost more than a 100 Million Euros. A number that had non been denied on the press conference. Let’s call the concept luxury plus. Luxury plus intelligence, plus sensibility, plus spirit. In other words: The clientele here is not only supposed to be rich, but also cultivated, open-minded. 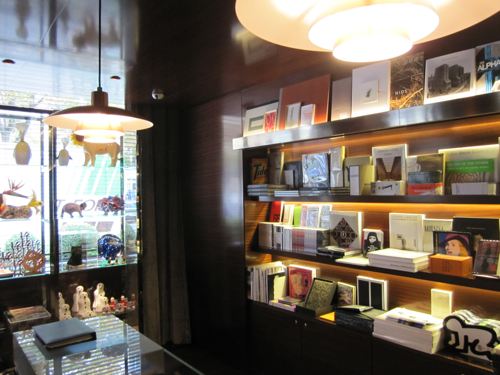 There is an art library with 700 books about art, architecture and design, a home cinema with 99 seats and from the cool lobby you can follow the Christie’s auctions with a headset and bid via your Blackberry. In the lift poems will be recited in the language of the guests that had arrived this day in biggest numbers. In each room the guest will find a guitar especially designed for the hotel and if he or she is very pleased with his or her performance, well, he or she can just asked for a mobile recording studio and it will be there in a few seconds. You’ve got the message? This hotel is for the smart tribe, as Starck calls them. It’s for the mobile generation, at home in Tokyo, New York and Kinshasa and hating nothing more than a clinical clear and impersonal hotel room where they would feel their global loneliness. Philippe Starck says that his work wasn’t not the work of an architect, but of a filmmaker, not of a designer, but of a semiologist. His aim was to spread a lot of subtle massages around the hotel. Up to you to see and to decipher them! His message is very strong in the lobby – they call it the antechamber – a 300 square metres area punctuated with little private salons and tiny display cases, full of memories and traces. It’s a kind of sentimental and familial chaos where the guest easily spots the space where he or she can feel at home. It’s cosy, it’s funny, it’s supposed to make you feel more intelligent, more brilliant, more creative. What do you want more? 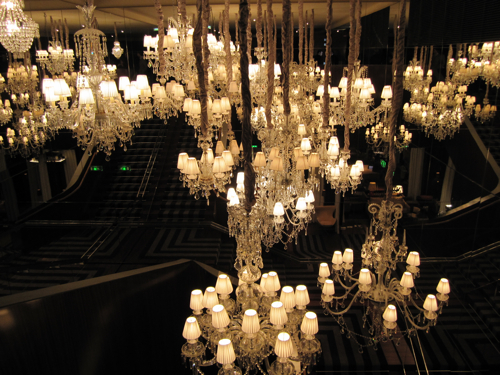 The classical codes of luxury hotels are remodelled here and you understand this immediately when you discover (and admire) the collections of the old Royal Monceau’s chandeliers grouped into a cluster, reflected by mirrors. You’ve to pinch yourself and remember: Your are not Alice in Wonderland! Or may be you are? 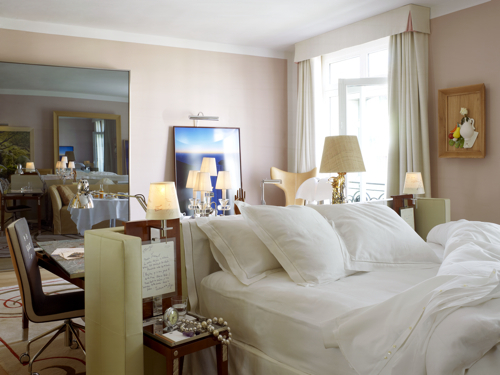 In the 85 rooms and 54 suites Starck’s message is more subtle, giving you air to breath and be yourself. But still, the guest has the impression that he enters a room where somebody already had lived. Was it the writer Andre Malraux or he jazzman Ray Charles? There are traces, books left, Walter Benjamin’s “One-way street” for example – you’ve better done some semesters of philosophy before checking in in the Royal Monceau. There are good vibrations in theses rooms. The bed occupies stage centre. Wall colours are whether in soft rose or in pale dove grey, natural leather is dominating, there is Freud’s canapé to lay down after a long walk, sketches and notes are taken on a light-shed, all is so arty, so original that you’re a supposed to feel a better human here. Such a pity that’s not enough to be intelligent and cultivated, you need money also: Room starts at 780 Euros and for a huge suite which can easily host the Brangolina tribe you have to count 22 000 Euros. Too much? 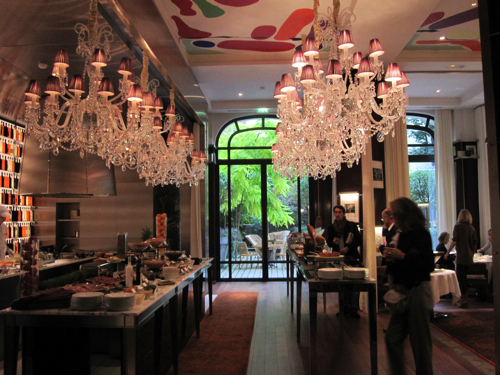 Well, it’s the “Palace for the parents”, Starck says. Their children, the generation of the “will be’s” – as Starck calls them – still can get the Starck-feeling at the Mama Shelter for much, much less. But, gosh, if I had the choice, I’d prefer to be rich. I would walk in with all my shopping bags from Chanel, Hermès and Dior, spent some days there, leave it all there, and walk out with nothing in my hands, all in my head, just free and creative.